While other people like to spring clean, I went to school for so many years that I’m still hooked on a late summer back to school schedule. When the notebooks and pencils start showing up in the stores I want to straighten out my drawers, closets and work areas. We rearranged some rooms in our house leaving a small windowless “bedroom” that I could use to store my fabrics, yarn and set up some lighting for photography. Previously my fabric lived in 3 different areas and I had no idea how much I owned! 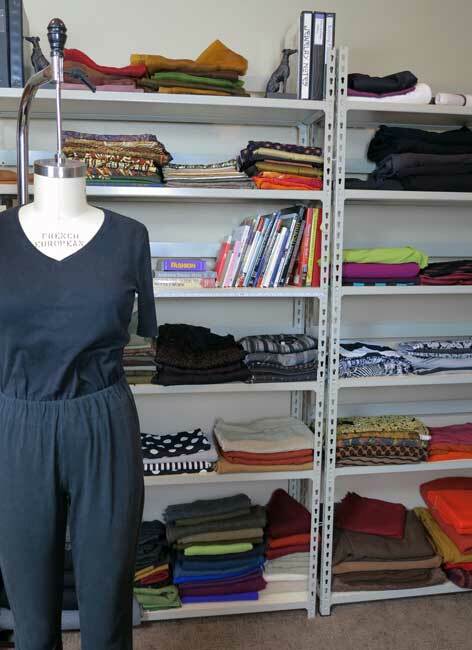 This stash may be too much to some, but I just love looking at those shelves of delicious fabrics in my favorite colors. The top left shelf has some lovely African batiks that I inherited, along with my silk and metallic fabrics. 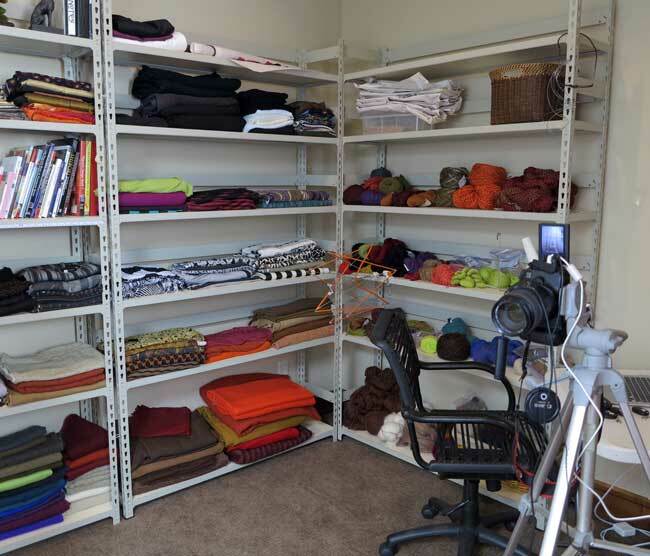 Sewing and knitting books also have a space here, and there is room to grow! The next shelf two shelves below the books are woven textiles. 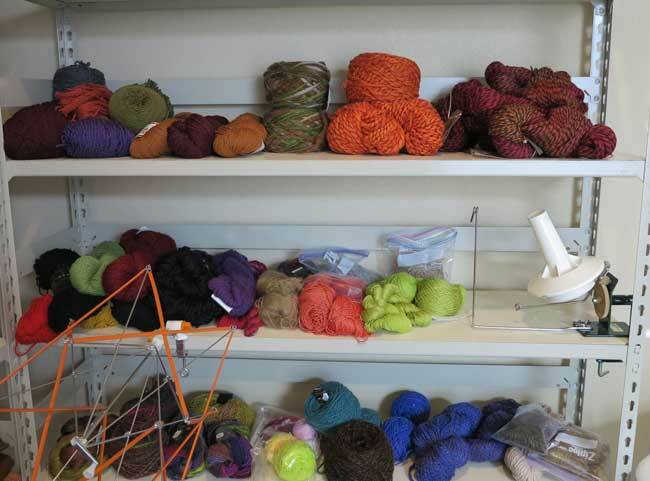 The shelf to the right is all knits except for more wool on the bottom shelf, and some leather rolled up on the top. My yarn stash is not nearly as large, and many of these are leftovers from previous projects. I have a different approach to my knitting than my sewing. As I near the end of a project I usually, I go to ravelry.com and look at patterns that I have favorited (I’m sure this word will be accepted in the dictionary soon.) in the past or research something I want to make, for example a new winter hat. Then I go to my LYS and pick out the yarn. The next area in my room is for my refashion stash. These are clothes that I have picked up at resale shops, or items from my closet that I no longer wear, but love the fabric or a detail. 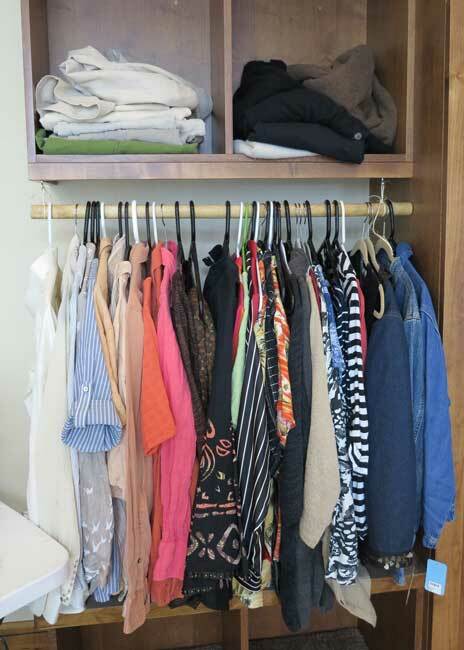 The upper left bin is all linen items. The right side box contains cashmere sweaters from my husband, myself and resale shops. Wash and dry them in the machine and they shrink up to a yummy softness. Moth holes virtually disappear, and I can then sew them into a new garment. 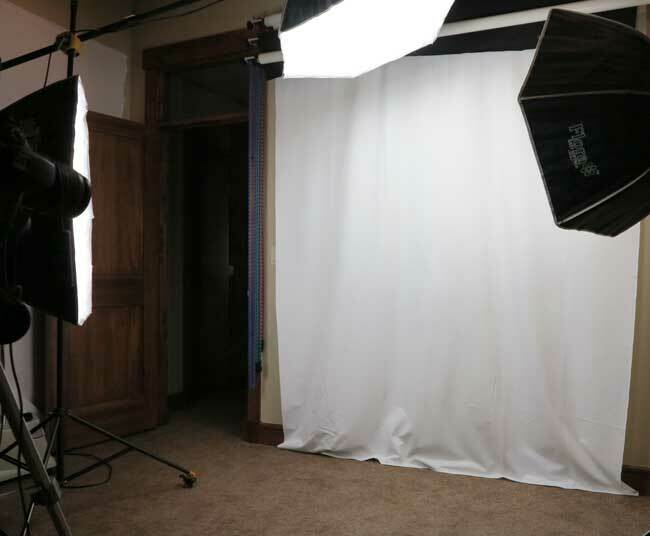 The photo studio is the last wall in this room. I’m at best a hobbyist at photography, but the new bright lights and pull down backgrounds should help with the post processing that I did previously to make up for low spotty lighting. I haven’t had time to test out the photo area, but I’m currently sewing two new tops that I will photograph for my next blog.